Alpacas vs. Llamas - What is the difference? | Alpacas of Montana, Inc. | Born, Shorn and Worn in the U.S.
Alpacas vs. Llamas - What is the difference? This is one of the most popular questions we are asked. No, alpacas are not llamas. Alpacas & llamas are in the camelid family, but each serves a different purpose. Closer relatives include the domesticated llama, the wild guanaco, and vicunas. This family of animals originated on the plains of North America about 10 million years ago. A common ancestor to the South American camelids migrated to South America about 2.5 million years ago. 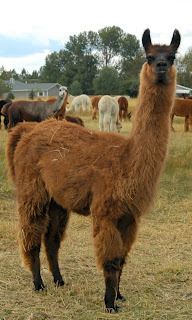 Llamas and alpacas can still interbreed which is called a huarizo. Alpacas are hybrids of the vicuna and the guanaco 6,000 years ago, created as a prized possession by the ancient Incas because of the quality of their fleece, which was spun and woven into garments. Llamas are about 300+ lbs, taller (4-4.5 feet at the shoulder) and are used for mountain packing or guarding livestock (often seen with sheep). They have always been a beast of burden. We shear our lllamas, but toss out their fleece. Our llamas are utilized to protect our alpacas. Alpaca fleece is measured in microns, which is a millionth of a meter. The average human hair is approximately 110-120 microns wide. Llamas usually range from 50-65 microns and alpacas from 18-30. Thus, alpaca fleece can be a sixth of a human hair wide, creating its soft, silky feel. The function and purpose of the alpacas is for it's fleece - soft, smooth, water repellent, hypoallergenic. Alpacas are much smaller (120-180 lbs and 3 ft at the shoulder) and are solely used for their fleece. They are a flight animal and will not stand up for themselves. We use llamas to help protect our alpacas from predators in addition to livestock guard dogs, Turkish Anatolians. One of the easiest ways to tell a llama from an alpaca is the "banana ears" on a llama, which arch inwards. Alpaca ears point straight out. There are approximately 300,000 alpacas within the United States. Alpacas generally live 15 to 20 years, with a few living up to 30 years of age. They stand 32-39 inches at the shoulder. At birth they weigh 10-17 pounds. An adult alpaca weights 100-190 pounds. The reproductive lifespan of a herdsire (sire) is from 4 to 16 years of age. Prime years are from 5-10 years old. The average growth rate of the coat is 5 to 10 inches per year. The average yearly weight of the shaved adult alpaca coat ranges from 7 to 10 pounds. Llamas get a bad wrap for spitting on people. Just like every dog has the potential to bite, so does a llama have potential to spit to protect him / herself when feeling threatened. In 15 years, with a variety of llamas, I have never been spit on or threatened by a llama. They are meant to be confident and bold. That is what they have been brought up to do. Give them some treats and a few scratches, they will love you like the rest of their herd.